This is a rather large genus with many species of bulb plants and a huge number of cultivated varieties. 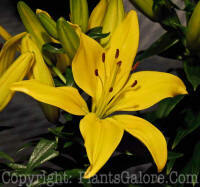 People get confused over the difference between the daylily (Hemerocallis) and the hardy lily (Lilium). Daylilies are herbaceous perennials that have grass-like foliage and bear flowers that last just one day. Hardy lilies are bulb plants that produce a single stem which bears several blooms that are often fragrant and each flower lasts many days. The pollen of Lilium is often orange or red and very oily while the sticky surface of the stigma of receptive lilies may exuced a clear liquid. * Guides and Keys are from the book "Herbaceous Perennial Plants A Treatise on their Identification, Culture and Garden Attributes" by Dr Allan M. Armitage of the University of Georgia. Varsity Press, Athens, Georgia. 1989 ISBN 0-942375-00. More on Dr Armitage and his other books.